I’ve been a St. Louis Cardinals fan all my life. Having grown up a few miles from Busch Stadium, some of the best memories of my life involve Cardinals baseball. Last night’s World Series game was one of the more exciting games in history – unless you’re a pure baseball fan. For the casual observer, high scoring games are fun. For baseball purists, 1-0 pitching duels that feature great defense and execution of strategy are better. 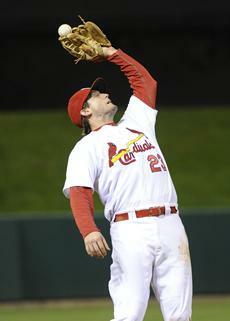 The St. Louis Cardinals won in extra innings last night over the Texas Rangers. But the reason they were playing in extra innings was really ugly: Terrible defense, no solid pitching and previous games that they had given away. I really hate the message that this game sends. David Freese is a hero, because he hit a walk-off homerun. But that kind of heroics wouldn’t have been needed if he had simply used two hands to catch the ball like they teach in Little League. Earlier in the game, Freese dropped a routine pop up because he was hot dogging: using one hand to catch, I mean drop the ball. The Rangers took the lead as a result of his error. Freese went from goat to hero by lining one over the wall in the 11th. Now the message that is sent to little ball players around the world is: fundamentals don’t matter. People don’t care if you are a solid player. They prefer theatrics. I do see an example of grace in this story. We blow it and Jesus saves us. He saves us not because of our performance but because we are nasty sinners and He loves us. But Freese is not the Savior. I also saw some chatter on Facebook about Lance Berkman being a Christian and I know for a fact that David Freese has recently given his life to Christ. Some are attributing the outcome of the game to the faith of these players. But that assumption doesn’t hold up for a couple of reasons. Cardinals starting pitcher Jaime Garcia also recently gave his life to Jesus but he was knocked out of the game earlier because he was ineffective. And players for Texas are outspoken believers in Christ. So much for God being a St. Louis fan. God doesn’t care who wins the World Series. While I am glad for the outcome of the game, neither the Cardinals nor the Rangers are playing like World Champs. It’s an ugly series. Game 7 should be interesting tonight. I guess I should stop analyzing so much and try to enjoy the game, huh? …not a chance. There is lesson in everything.